Fans of The Vampire Diaries have something to sing about today: Spin-off series The Originals has been given the go-ahead to series. The backdoor pilot aired last night as a regular episode of its parent show, picking up a modest 2.24 million viewers and a 1.0 rating in the 18-49 demographic. Considered a shoe-in for a slot on the fall schedule, the spin-off was developed by Julie Plec. The ratings were the second lowest of the season, actually, just a tenth of a point ahead of last week’s episode. 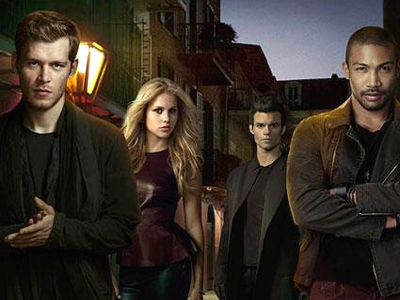 The Originals stars Joseph Morgan, Daniel Gillies, and Claire Holt, and follows the world’s first and most dangerous family of vampires in the French Quarter of New Orleans. Plec will executive produce the new series along with Leslie Morgenstein and Gina Girolamo. The network is one of the most supportive homes for fantasy on television. It has already given early renewals to The Vampire Diaries (now in its fourth season), along with veteran Supernatural and newcomer Arrow. The CW also renewed freshman show Beauty and the Beast and sophomore Hart of Dixie today — great news for fans of those series, but less so for science fiction fans eying the network’s large slate of genre pilots. The CW already programs fewer prime-time hours per week than CBS, ABC, FOX, and NBC, and the renewals leave fewer hours for new shows. Among contention for next season are The Hundred, Oxygen, The Selection, and The Tomorrow People — more genre pilots than any other network. The Wonder Woman series Amazon already looks to be re-shelved. We’ll continue tracking The Vampire Diaries along with The Originals in our SciFi Stream episode guides. Watch this space for more on The CW’s fall pick-ups!